So, your spouse/child/roommate/classmate/self has requested that you make authentic chocolate chip cookies (i.e. NOT chopped Dove cookies). While your cosmi c twin expends virtually no effort opening a pack of break-n-bakes in Alternative Universe America, you’ll be whipping up a batch of homemade cookies with only a couple months of advance planning! Follow these easy steps. Start this about two months in advance. Options include having your mom send them in a care package (if it’s not summer) or picking up a pack during your upcoming visa run to Hong Kong. You may only need a couple of weeks for this one. You could go with ordering on Taobao (be sure to put a Styrofoam shipping box in your cart, too), seeing if there’s enough foreigners to go in on a pifa order, or, you could make multiple trips to the supermarket, allowing for all the trips when they are out of butter, again. You can use local if don’t mind the funky vanillin scent. Otherwise, Mom/Hong Kong/Taobao. Freeze the flour to kill the weevils and their eggs. Sift all the carnage out. If you think back far enough, you might remember living in a country where the brown sugar is mostly lump-free. But you’re not there now, sweetie, so get to work eliminating those crystalline rocks. Some people like to add walnuts, some people like to add M&Ms, but NO ONE likes the addition of poo or feathers. If it’s winter, this may involve wearing the block of butter zipped inside your multiple layers of clothing in order to make use of your body heat. “Room temperature” is relative, friends. Let’s see, 1 cup of butter (a measure of volume) equals how many grams (a measure of weight)? Step 9 – Start Mixing! Step 10 – Stop Mixing! But then the power goes out. Hmmm….switch to a wooden spoon, or hope this outage doesn’t last long? Step 11 – Resume Mixing! 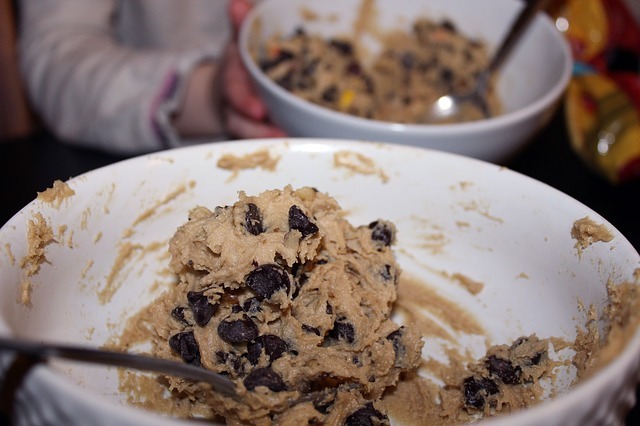 The power comes back on, and you rush back into action, hoping it will stay on long enough to both mix the dough and bake all the batches of cookies. Since you can only fit one small tray in at a time, this will take much longer than when you could fit multiple full-size cookie sheets in an oven. Upside is that your kitchen will smell like cookies for that much longer. Finally! After two months of planning and lots of hard work, the cookies are ready! Wait, you want a glass of ice-cold milk with those? Hmmm…that’s going to take a little more planning. Great post. Sending you some of Dave’s awesome cookies by the next post. Just dunk in your tea to regain that soft just-baked texture. Real, imported chocolate chips can be purchased at a foreign goods store for only $7 USD. Not to be found at the pifa though. Carol, that’s great that you can get real chocolate chips at your foreign import store. Makes things a lot easier, though not cheaper. This made my day. Subscribing. And you subscribing made MY day, ErinMP! 🙂 Thank you! I visited my son in China a couple of summers ago. I learned some of those lessons the hard way. Just wish I’d crammed the suitcase full of chocolate chips to give to his co-workers!! !